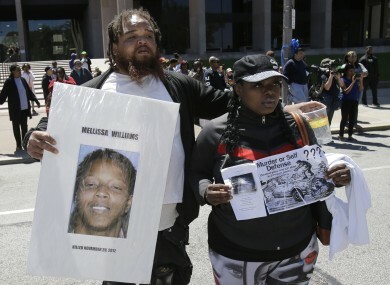 Alfredo Williams, left, and Renee Robinson, cousins of Malissa Williams who is one of the victims, protests outside the courthouse after the Michael Brelo verdict in May last year. US AUTHORITIES HAVE sacked six police officers who unloaded 137 bullets into a car carrying two unarmed black people, killing the pair in a hail of gunfire in Cleveland, Ohio. City officials, who have faced criticism for failing to take action sooner after the 2012 shooting, said they hoped the sackings would bring “closure” to a city struggling to rebuild trust following a series of high-profile police killings, including that of a black boy. Cleveland pledged to overhaul its police force and aspire to “bias-free” law enforcement under an agreement reached with the US Justice Department in May. The “consent decree” was announced two days after protesters filled Cleveland’s streets following the acquittal of a white police officer charged in the November 2012 incident that left Timothy Russell and Malissa Williams dead after a car chase. Patrolman Michael Brelo, 31, was one of 13 officers involved in the 35 kilometre high-speed chase. The car of Russell and Williams had backfired as it drove past Cleveland police headquarters, and police thought the sound was a gunshot. A total of 137 rounds were fired at their car, including 49 by Brelo. He shot the final 15 from the bonnet of Russell’s Chevrolet Malibu. Six officers, including Brelo, were fired and six will be disciplined. One has retired. Brelo was acquitted of voluntary manslaughter last May. City officials said the officers crossed the line and endangered their fellow officers when they unleashed the barrage of bullets in just 20 seconds. Cleveland police also faced severe criticism after Tamir Rice, a 12-year-old black boy carrying a toy gun, was fatally shot by a white officer at a playground in 2014. A grand jury declined last month to issue charges in that case. Mayor Frank Jackson defended the amount of time it took to discipline the officers. “What we’ve talked about from the beginning is conducting a process that has due process at its core and is fair,” he told reporters. But police union president Steve Loomis said he expected the six sacked officers to get their jobs back. “The politics in this city is absolutely appalling,” he told reporters. It’s tragic that it went down this way, but at the end of the day, two people high on crack cocaine, high on marijuana, one of them intoxicated, made the decisions that they made and we responded. Email “Police officers sacked after firing 137 bullets in 20 seconds at unarmed pair”. Feedback on “Police officers sacked after firing 137 bullets in 20 seconds at unarmed pair”.